Seafood can be intimidating, we totally understand that. We're offering a Sunday dinner that will consist of at least 7 courses. Each course will feature a unique seafood ingredient that is available in our market. It's a great opportunity to try some interesting and new seafood preparations you might haven't though to try at home! It's also a great excuse to get a few friends together and end the week with people you love. We're now accepting RSVP's for the Sunday dinners. Please call us or come by more information. We're limited to 12 seats for each dinner and service will start promptly at 7 PM. A new gourmet market has made its Sherman Oaks debut with seafood, tea and more. Here are LA’s most exciting new restaurants that opened in July, followed by the overall best spots in town at this very moment in time. The Joint in Sherman Oaks Combines Coffee and Seafood May sound a little kooky, but locals are loving it. 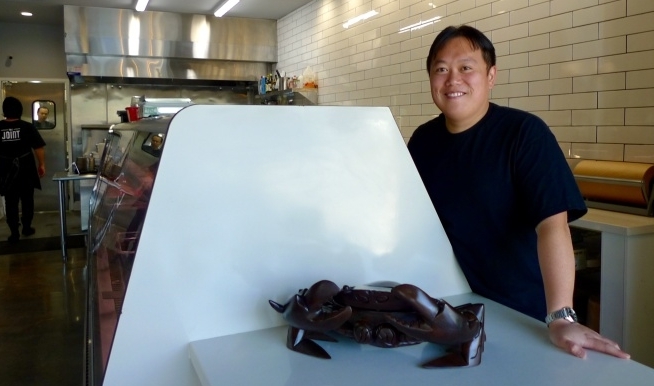 The Valley’s New Fresh Seafood Marketplace Comes With a Side of Coffee. California Uni Is Having Its Moment in the Sun. The Joint Hooks Sherman Oaks With Coffee and Seafood Next Month. The Fish Whisperer Who Just Opened A Sustainable Seafood Shop In Sherman Oaks. The Joint will be a gourmet café and market offering specialty coffee, tea, and premium seafood. Opening in early 2017.